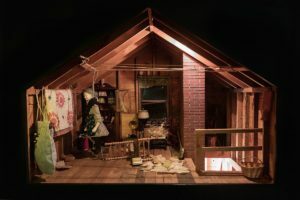 Did you know about the intersection of doll houses and forensic science? Francis Glessner Lee, the first woman police captain in the country, widely considered the mother of forensic science, used meticulously crafted doll house scenes to teach aspects of detective work. Using real homicide cases for inspiration, each diorama includes painstaking clues such as the angles of bullet holes in the walls to portray a story and teach real police officers how to solve mysteries. I am really sad that I missed the exhibit at the Smithsonian, but the web sites still have a wealth of pictures and information.